A transparent plan and reliable delivery commitments are the core challenges manufacturers are facing – especially when they run a job shop with high mix - low volume. Therefore coming back to any kind of scheduling tool is indispensable at a certain point of business scale. The market offers a various range of different scheduling approaches for different situations and with different focus. Hence it is definitely worth to invest a broad space of time upfront to test different options and to investigate which is the best solution for your business. But in practice one can see in a lot of cases that the scheduling efforts after this “investment period” ramp down and often scheduling tools disappear on the Q.T. So it is not only necessary to find the right tool, it is even more critical to use this in the appropriate way. This blog deals with the three critical factors that determine the success of production scheduling when using a scheduling tool. A regular time flow per cycle. Within the structure it is important that every employee knows his individual role. Commonly it is separated between planers that have the right to make changes to the schedule and employees that work on the shopfloor (“operators”). A scheduling cycle implies that planners communicate the schedule to the responsible operators regularly (e.g. every morning). On the other hand it is as essential that the operators communicate the shopfloor progress back to the planers regularly (e.g. after each shift). Only if this cycle of communication is running smoothly the scheduling tool will contribute to achieve the core targets. This communication is essential to keep the schedule current and the execution in sync with the schedule. Also it is necessary that the information is complete (e.g. shopfloor data from all workstations) and that all participants always reliably contribute to the information flow. In this regard it is very beneficial if there is one responsible person – a planner - to monitor the full process. Scheduling is per definition the planning of future actions. But in a high mix - low volume business the planning field is very, very dynamic. Hence unexpected incidents are daily business as they appear constantly. This can e.g. be a machine breakdown or just the awareness that the production of the customized job takes significantly longer than originally estimated. Therefore the information about what is happening in the shopfloor always has a lasting impact on the schedule that must be considered to ensure a reliable picture of delivery dates. It's quite obvious that establishing the processes as described in #1 “automatically” helps to integrate shopfloor data. But nowadays there are also software solutions available that easily track shopfloor progress data which support the communication process in a very comfortable and productive way. Once the data are communicated to the planer they need to be inserted into the new schedule. Here it is helpful if the scheduling tool supports the planner in easily updating the schedule. Even though it is essential to estimate your scheduling data preferable well grounded and to integrate shopfloor data as actual, don't take the bait to be meticulous! As we learned: job shops are so dynamic that the quality of data are subject to a very short value time. Therefore it is not efficient to spend too much time on optimizing the data quality and don't waste time to fussily administrate as is times of finished operations. As time matters be pragmatic and go with an “80/20-approach”. Better is to be prepared to reschedule on the fly. In a nutshell: the evaluation of a sufficient scheduling tool is one step. Gaining a benefit out of it is the more challenging and continuously ongoing one. 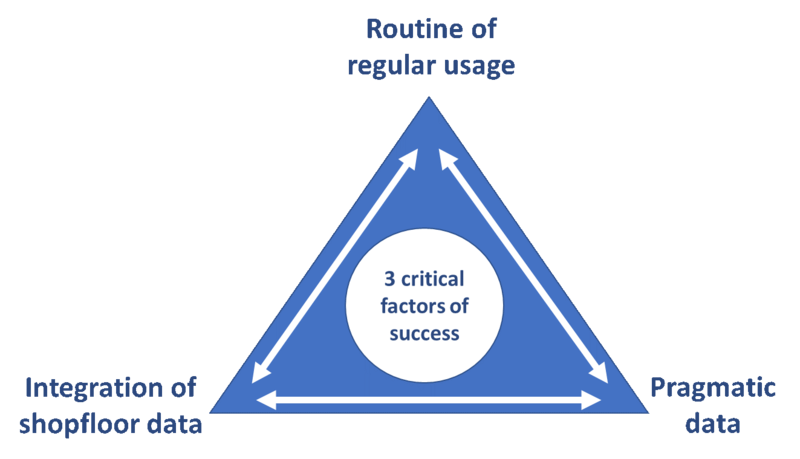 But if you manage to establish the triangle of scheduling success you will gain an enduring advantage for you manufacturing business. By the way: we built just plan it following the idea of a systematic visual scheduling cycle (#1) allowing the easy integration of shopfloor data (#2) and being able to live with pragmatic data (#3). Why not giving a try?